Class 99 steam locomotive used by the Deutsche Reichsbahn. The building instructions are very detailed and show step-by-step the building of this set. In order to build the set you need the Power Functions set consisting of the PF train engine, battery box, and IR receiver. The Power Functions Set is optional/not included. Almost all parts are brand new (only 8 are used, but in good condition). The set includes 2 special printed bricks and 6 stickers. 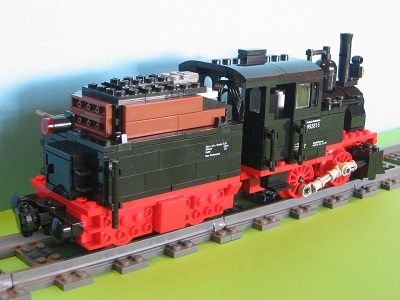 You can built the tender of this set with black or red RC train wheels. These train wheels are not included in the set. You can order the rare red RC train wheels as a supplement to the set (+ € 7,50). If you do not want to motorize the set you can also use a dummy train engine to build it. The battery box can easily be modelled by using some 2 x 4 bricks. You don’t need the IR Receiver in this case. Class 99 is the classification of German narrow gauge locomotives used by the Deutsche Reichsbahn or her successor administrations. Class 99 is divided into numerous sub-classes. This DR 99 2815 locomotive is modelled after LGB model 22150. LGB stands for Lehmann Gross Bahn - the "Lehmann Big Railway" in German. 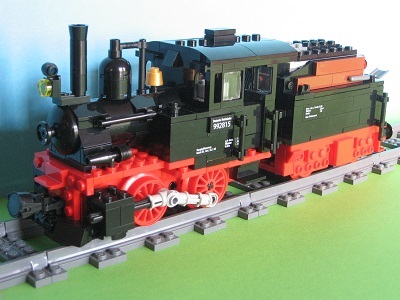 It is the most popular garden railway model in Europe.